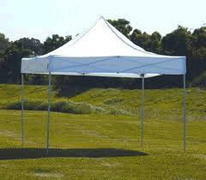 We offer 10x10 shade tents, they are pop ups that have approx 100 sq ft. These are great for any event large or small and keep the sun at bay and also the rain on those summer days when showers are the norm. they are all different colors white, grey and sometimes blue. At this time we deliver what we have available in stock at the time. So you may get 2 to three different colors.